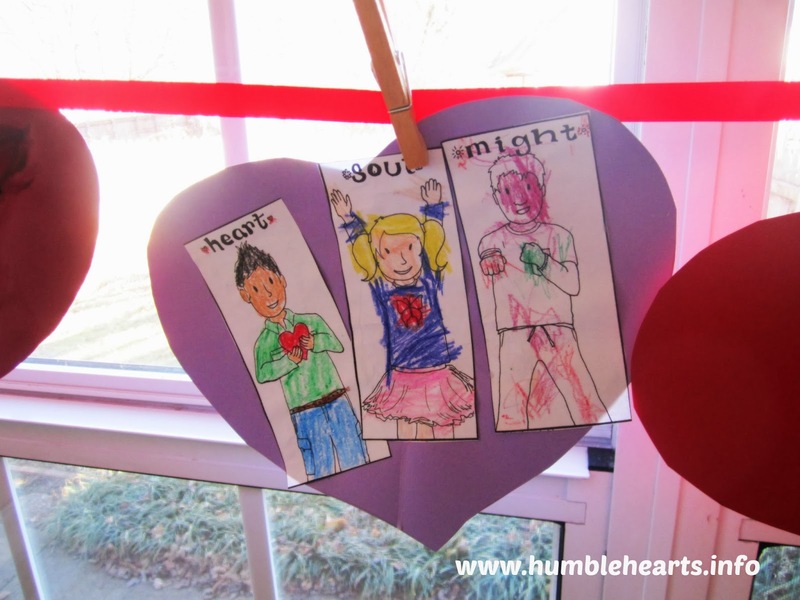 With heart decorations all around this time of year, it is great to teach children what the Bible says about the heart. There are a lot of different visuals/craft ideas in this post. You don't need to do all of them to teach this topic (especially if it overwhelms you to do all of them). I find the heart puzzle to be extremely helpful when teaching. If you only have time to do one visual, that would be the one I would do. Song: “You Shall Love the Lord” from Hide ‘Em In Your Heart Volume 1. View video here. When people draw a picture of a heart it looks like this. We don’t think with our heart. It is a figure of speech to get your attention. God wants us to love Him with all of our heart. We don’t have anything more important than God. Are we to love God with a little of our heart? 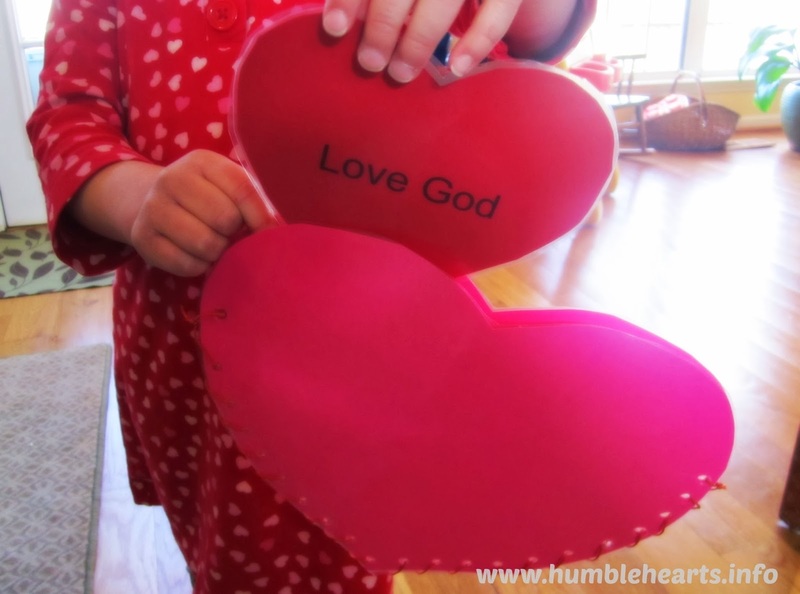 (put one puzzle piece on) Do we love God with half our heart? (put second puzzle piece on) Do we love with all of our heart? Look under "Supplies" for the links to print out this puzzle. If I loved God with just a little of my heart (first puzzle piece) it would mean that He isn’t very important to me. If I loved God with half of my heart (put second puzzle piece) it means that what He said was sort of important to me, but I would also do what I wanted to do. If I loved God with all of my heart (put last puzzle piece) then nothing is more important to me than God. I always do what He says to do. How do we know what God wants us to do? Read the Bible! Puzzle: Have the child put the heart puzzle together. Review loving God with a little of your heart, half your heart, all of your heart. 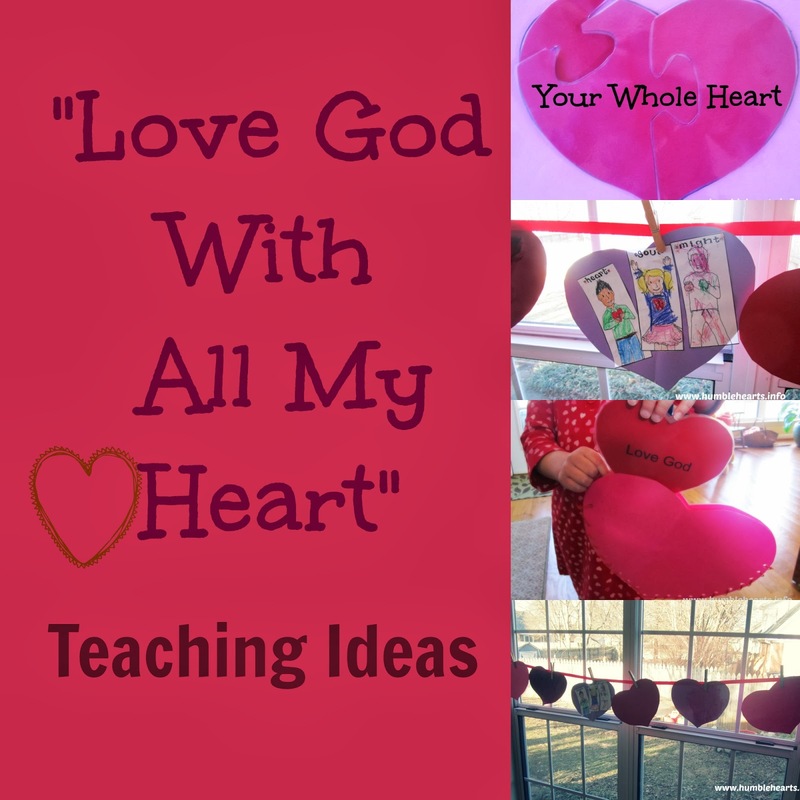 Heart Banner part 1: To make a heart banner cut out 4 large hearts from construction paper (there will be 4 teachings on the heart, each one will have an idea for decorating a heart on the banner). Hang up string or ribbon (we used push pins in the wall). 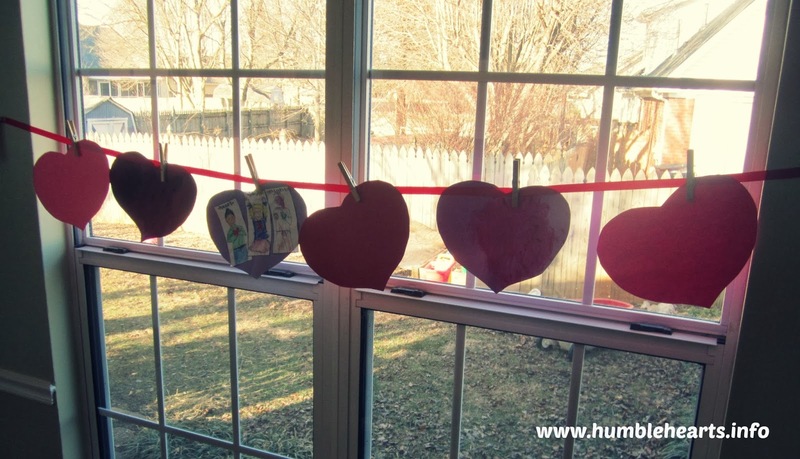 Use clothes pins or paper clips to attach hearts to string or ribbon. For the first heart, color picture (from here) of 3 children and glue them to the heart (when printing out the picture you may want to reduce the size slightly to make the picture fit on the heart). We made 2 extra hearts to fill our ribbon. 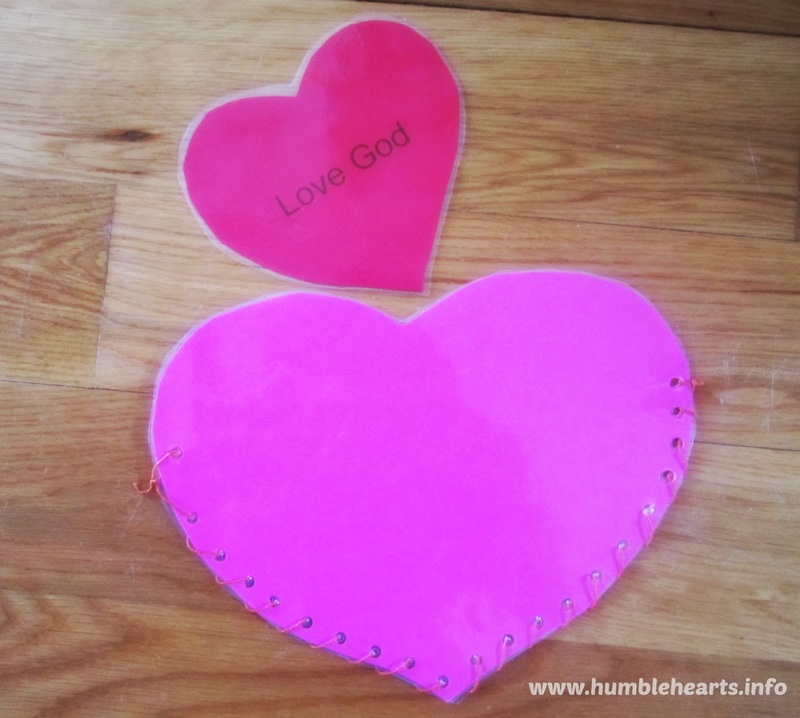 Heart Pouch part 1: Attach 2 hearts together at the bottom to make a heart pouch (glue, staple, or lace together) Make a smaller heart that says “Love God” Have your child put the small heart in large heart.